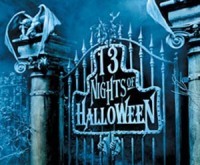 ABC Family brings the thrills and chills with 13 NIGHTS OF HALLOWEEN, a celebration filled with scares as you countdown to Halloween. The popular programming event, now in its 16th year, starts Sunday, October 19, 2014 and concludes on Friday, October 31st. The fright fest features brand-new Halloween-themed episodes of “Melissa & Joey” and “Baby Daddy,” an all-new “Pretty Little Liars” fan appreciation special, plus the hilariously scary prank specials “Freak Out.” The stunt will also include the network television premieres of “Dark Shadows” and “ParaNorman,” and a ghoulish mix of Halloween-themed programming. 8:00pm – Disney·Pixar’s Monsters, Inc.
Let us know… did your favorites make the schedule? I certainly hope other channels give more features then this and not do many repeats. I wish they would bring back some classic 80’s Movies like “Happy Birthday To Me, The Midnight Hour, Grimlins, Ghost Busters” and the likes. I know right. I watch it every year with my kids because my son birthday is on Halloween. And its basically the same programming every year minus the one new movie they may add. The lineup is horrible and its just repeats. I would rather watch all of the simpsons halloween specials. Which im pretty sure fxx will probably do since they’re playing every episode on their network now.